Maradona Starts With A Bang At New Club! Diego Maradona has started life in the best possible way at his Mexican club as he led Dorados to their first win of the season and also their first victory in seven matches on Tuesday. Maradona was named boss of the Mexican second division side earlier this month and it is already looking like a wise decision. A hat-trick from Vinicio Angulo helped fire Maradona’s men to the 4-1 triumph. 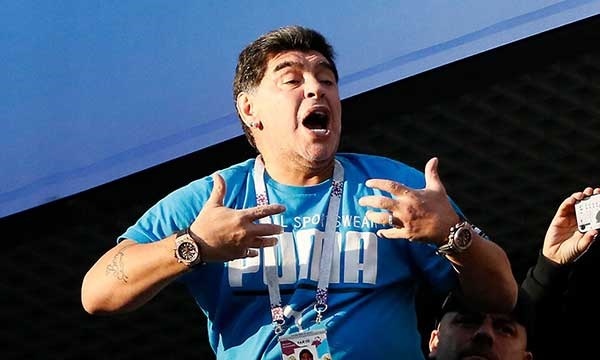 The Sun reports that, afterwards Maradona, 57, joined his players and adoring new fans to celebrate on the pitch before launching a scathing attack on his doubters. “We played a great match. Some people said Maradona’s useless. There were a lot of stupid people going on television to fill up the time,” The Sun quoted Maradona as saying. Ecuadorian striker Angulo struck a quickfire double on the hour, and although Sebastian Ibars got one back for the visitors two minutes later, the hotshot sealed his treble from the spot before Alonso Escoboza added the gloss late. Maradona added: “I’m not here to steal money from anyone. I came to work not to keep mouths shut. “Nobody knows what I’m doing during the week with my coaching staff so that’s why some voices are silent now. “There is no Maradona effect. I knew that we will win when I saw them train with desire, with hunger, these guys are hungry for glory.